I've got some potential bad news for the android auto fans out there. My car was built in Dec of 2018, and has software version D.1.1.2. There is no Android Auto icon on the homescreen, but has some other updates (nav zoom) that haven't been seen from what I understand in other threads. 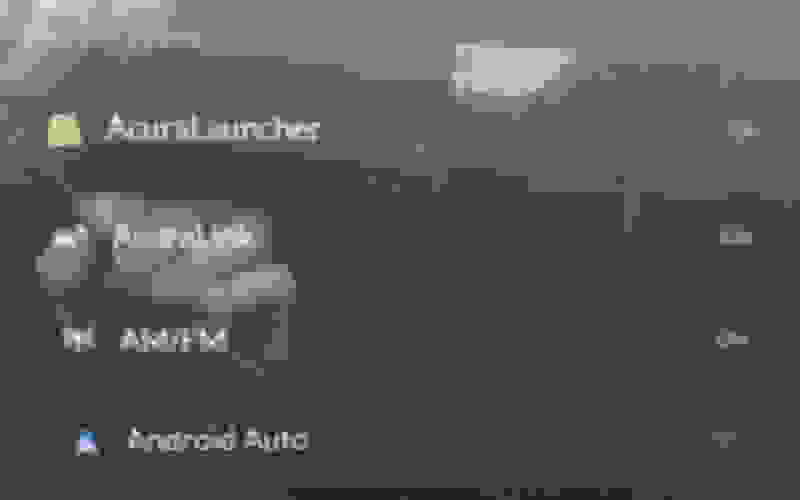 I suppose it is possible that the Android Auto icon does not appear until connecting an Android Auto capable phone, but it seems like the lack of icon hints that it will not be in this software release. So is that it? No Android Auto? I use Apple CarPlay for basic hands free phone functions: playing music, send/receiving text, access to contacts and maps. You do get most of this functionality with some bluetooth/Handfree functions, but not as seamless and easy to use. I'm experiencing all these same issues. I regret buying this thing now. Honda really let me down. As acura is not giving out much info and claiming google is working on true touchpad integration, it seems asking questions on google forum might get some attention. We can search for "acura rdx" on below webpage and post questions. A few are already there. Hello...I bought this one... Belkin F7U017bt Universal Car Vent Mount for iPhone, Samsung Galaxy and Most Smartphones up to 5.5 inches (Latest Model) but it does not seem to clip securely onto the vent. I'm wondering if I may not be installing it correctly and if the one you purchased would do any better? Seems like it should be pretty easy to attach. I have the 2019 Acura RDX Advance. Any advice on how to make the one I have work would be much appreciated. If I cannot get this attached securely then I may purchase the one you have and hopefully I will have better luck! The one I bought has two vent clips which makes if very secure (no vibrations). It looks like the Belkin only has one clip, so I'm wondering if that's the issue. Btw, I just bought another BesTrix clip for my wife's MDX and it works like a charm. I'm planning on buying an iPhone 6s to use purely as the Android Auto phone - sure it's 250 out of pocket, but then I'll never have to sit there miserably wondering when AA will get here - if at all. I'll just have it tethered to my Android's internet connection and use CarPlay through there. And if anything, it can also be a spare phone if I ever need one. IMO, it is only worth it if you are a confirmed WAZE or Google Maps user. Other than that, what does it really get you? Some dictated texts? Haha! You make a great point! I love Google Maps and its routing. Personally, I think Waze tells drivers to make extraneous detours just save 1-2 minutes - like, going local and making a bunch of turns for <5 minutes difference. In that situation I'd rather have an easier drive on the highway than to make a ton of turns on local streets. Google Maps has a better balance of highway vs. local roads and only tells you to go local if the traffic is significant. Though, to be honest, I really would rather just use Acura's navi since...that's what I paid for. Except, I've read from so many people on here that the system's traffic flow is pretty subpar and is some times outright missing. Personally, I prefer the clean, consistent interface of Apple CarPlay over having a different interface in virtually every vehicle - even by the same manufacturer. The RDX's traffic information comes from select HD Radio stations, so coverage is basically limited to "big cities". No... Not even close... I use the MLB At Bat app to listen to games, audiobook, podcast, iHeart Radio, Google and Amazon Music, Tune In Radio Pro and some other apps, but Waze is my go to for commuting to work and home as it is updated by users more quickly than any other traffic system. Google Maps is also superior to any navigation system out there. My default is to stream my music from Amazon, or I just listen to the lower quality XM. If I need to actually navigate through traffic, I use WAZE or Google Maps, otherwise, if I’m just putzing around, the in-car nav has been enough for me since it now zooms and I can send destinations. Last edited by Madd Dog; 02-26-2019 at 10:37 AM. You could literally just use Google maps for every single region you're selling the car - minus China maybe. I've used several streaming music services over the years and find that Apple's Music service offers very good sound quality, but the thing I like most about it is the curation - it's top notch. XM's streaming app offers much high quality audio than their satellite feed, but is obviously less convenient to use. It's too bad the 4G LTE connection isn't used for streaming audio - it could offer both high quality audio and convenience. HD Radio provides a data path for traffic information at no cost to the vehicle owner. Otherwise, a cellular connection would be required and someone would have to pay for the data. Google has to get live traffic information from somewhere! Last edited by zroger73; 02-26-2019 at 10:47 AM. Our "other" car a 2015 Ford Escape Titanium, came with FREE traffic data provided by SiriusXM for five years, regardless of any other SirriusXM subscription status. It seems to work well. I just picked up my RDX last night and I didn't think the navi was lagging or slow at all! I actually loved how specific it was with directions - like use the left lane to make a left turn in two lights. I like that it's capable of using easier to understand measurements. Google maps and Waze always use "feet" for local roads. So far i've been pretty pleased with the Navi as well. One time it did try to give me some crazy route that didn't make sense (10 minutes vs 5 minute normal route). Otherwise, it works pretty well and I like the ease of use. I'm good with this until Android Auto comes out at some point (hopefully). Yes! It did something similar for me on the 1 hour 15 minute drive I had going home from the dealership (I went a bit farther for the sake of a good deal & service). It told me to take an exit ramp that would technically still get me home, but wouldn't be the most efficient. It was already so late at night that I was positive traffic wouldn't have been an issue on a Tuesday night. I'm not sure what the deal with that part of the routing was - but, really everything else was perfectly fine and I honestly don't think I need AA that badly. Sure, I'd like to have it, but I too, can also live with this system until AA gets released. Surprisingly, right before I set my destination in the car, the dealership I was at told me that no matter what navi any car comes with, Google Maps will always be superior and that it's unfortunate that AA isn't here yet. So I set off expecting the worst, and honestly I ended up being pretty happy about it and is definitely one of the highlights of the car for me. Yes I noticed it didn't give any exit #s. But, it does tell you towards "Lincoln Tunnel", for instance. Then in that case I know that Lincoln Tunnel is the exit I'm looking for. So when signs start showing "Lincoln Tunnel", I'll start to anticipate having to take the exit. But I do agree that not having exit numbers, is a pretty bad idea. Instructions wise, it hasn't been too slow yet but then again, I'm also driving areas where I'm very familiar with so maybe that's why. NY/CT/NJ so far hasn't shown any issues. I'll have to do an actual road trip to see how it does. FWIW though, my previous car with AA was definitely slow with lane change instructions too. I was browsing around in Settings and happened to find this in the Notifications. My car is updated to the latest software. Any thoughts? 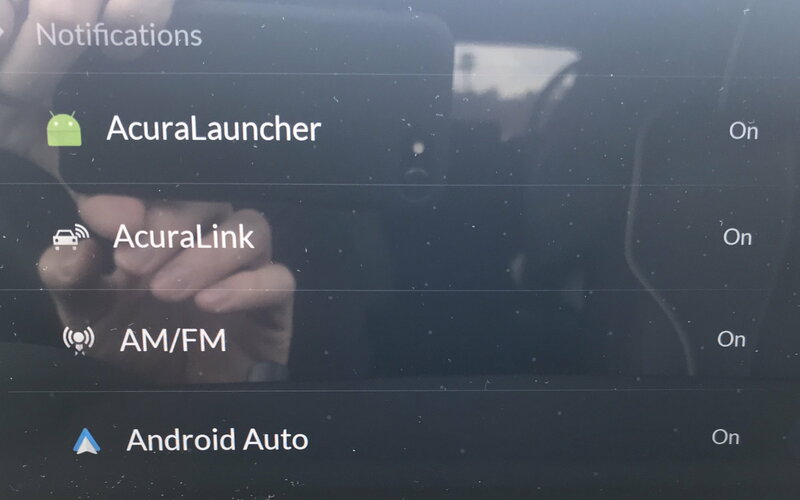 I noticed this on mine as well, but I think that was put there in anticipation of adding AA when Google is finished getting it to work with Acura's TrueTouchpad. As others have said, we don't know when, but it is likely, especially if Acura s going to this type of input system on future vehicles as well. The Acura system is android based, so I think that is why that’s there. Last edited by GBraidi88; 03-06-2019 at 02:54 PM. That said (and coming from a longtime Acura fan), it is inexcusable that they are advertising a feature that doesn't work. To blame Acura's inability to make this work on Google is equally ridiculous. This is a class action waiting to happen. In the 90's I owned a Yukon. A few years in I got a class action letter telling me that I was a member of the class if the size of the gas tank was an important part of my buying decision. It seems that GMC advertised the Yukon as having a 19.4 gallon gas tank, when in fact it had "only" a 19 gallon tank (or something like that). I was, of course, devastated by that news so I responded in the affirmative. A few months later I received a voucher for $850 off my next GM car or a $300 check. If less than a half gallon of gas was a buy/not to buy decision and was worth $850, then what is a non-functioning AndroidAuto worth (that may have actually been part of the buying decision)? But, where in the Owner's Manual, Monroney label, Honda's website, or other paperwork does Honda promise Android Auto? Saying "Android Auto is coming to the RDX" is worthless. In 2010, GM recalled 1.5 million vehicles that used a heated washer fluid system that could overheat and cause a fire. Rather than fix the problem, the just disabled the system and gave owners a $100 check for the value of the feature. More recently, Honda advertised the lower Ridgeline trims as having walk-away auto lock. Instead of adding the feature, they sent a gift card to owners who complained. A similar issue happened with HD Radio on the CR-V EX-L without navigation. Ford paid owners up to $1,050 over incorrect fuel economy ratings. Hyundai had a similar payout. Ford bought back, made cash payouts, and discounted new vehicles for owners of 2011-2016 Fiesta and Focus models with the PowerShift 6-speed dual-clutch transmission. And, let's not forget Volkwagen's "diesel-gate". I knew Android Auto was not included, and they did give AA a “we are working on it”, but they never said it was here, and they never gave a date certain. When I first spoke to my dealer (end of January), he said they were expecting it before the year end. When I purchased the car at the beginning of March, his "official" line was still end of the year, but said they were realistically expecting it within 3 months. But he wasn't allowed to say anything sooner than end of the year in case there were delays. “Soon” has different definitions, depending upon whether you are speaking in geological terms or are hanging by your thumbs and will be released “soon”. I may have some good news. I emailed Acura ~2 weeks ago. I just got a call from "Acura and Car Technology Support." The representative said that Acura has confirmation that Android Auto will be coming with the next software update. However, Acura doesn't have a specific time on when the software update will be released. If I was going to venture a guess, it will be June since that is when the 2020 model hits the showroom. I was hoping for the first quarterly map updates to come through in June as well. One of the biggest knocks on the RDX is the infotainment. Being on the latest 1.1.2 version, I haven't experienced a single freeze or issue so far. I can only hope that Acura builds on this and gives a trouble free AA experience. I wouldn't expect the 2020 models to arrive until the fall. What makes you think they will arrive in June? A fun issue of mine is that I like to listen to talk radio on AM, but every time I get a phone call and finish the call, the radio is no longer available period. Even if you turn the system off and then back on.